From it's perch high atop the bluff overlooking the Strait of Juan de Fuca and Ediz Hook, this adorable 2 bedroom/2 bath cottage is an absolute delight and the perfect hideaway to relax and enjoy the Northwest's pleasures of both land and sea. Close to downtown Port Angeles's restaurants, coffeehouses, antique stores and waterfront, the cottage is a wonderful home base for both couples and families. As you enter the home, the interior of this 2 bedroom cottage is warm and inviting with hardwood floors throughout, beautiful decor and cozy furnishings. Water views can be seen from the Living room, Kitchen, Dining room and Master bedroom. An enclosed sun room with bright Adirondack chairs also allows a protected viewing area of the below harbor and stunning sunsets. The charming kitchen and dining room are ready for preparing and enjoying your meals together in front of the large picture window with sea view. Evenings can be spent reading a great book, enjoying lively conversation or snuggling on the couch in front of a good movie. Retire in one of the two bedrooms with comfy queen beds made up with quality linens and bedding. Both bedrooms have en suite bathrooms, the Master bath with a tub/shower combo and the 2nd bath with a shower only. Adventure seekers will also love having the mud room ready for storing bikes, kayaks or hiking gear. The Land and Sea is perfectly situated for enjoying all the Northwest Olympic Peninsula has to offer. Just a couple miles from downtown, enjoy a locally crafted beer or cider from the NextDoor GastroPub or BarHop Brewing Company. Coffee is of course a major part of the Northwest lifestyle, and the cottage is just minutes from 3 very popular coffee houses; Bada Northwest, Bella Rosa or Easy Street Coffee and Tea House. Downtown also has a vibrant waterfront with eclectic gift shops, antiques and book stores. The Country Aire Market on E. First Street is perfect for grabbing local organic produce and groceries while High Tide Seafood on Marine Drive is perfect for picking up the fresh catch of the day or local Dungeness Crab. Rent bikes and enjoy the Olympic Discovery Trail along the waterfront and out to the end of Ediz Hook. The kids will also love visiting the touch tanks at Feiro Marine Life Center on the City Pier. The first entrance to the Olympic National Park at Hurricane Ridge is just 15 minutes from the home where you can enjoy panoramic views of the majestic Olympic Mountians. Just a 30 minute drive west of the cottage are Lake Sutherland and Lake Crescent where you will find numerous hiking trails and kayaking adventures. Sol Duc Hot Springs is about an hour from the home and boasts a stunning double water fall trail and hot pools to soak in. Further adventures to the Pacific coastal beaches, sea stacks and tide pools are just under a 3 hour drive. Don't forget to take a day trip out to the gorgeous Hoh Rain Forest and tour the Hall of Mosses. 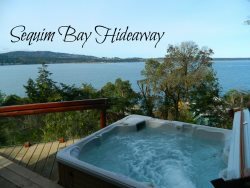 Other popular destinations are the Dungeness Wildlife Refuge and Spit, Olympic Game Farm, Salt Creek Recreational Area/Crescent Beach, Hollywood Beach, Seven Cedars Casino, Elwha River Casino and more! Unprotected bluff; Please stay 5 feet back from edge. Check in is at 4 P.M. Check out is by 11 A.M.